The games we create are built on the work and passion of those who came before us. 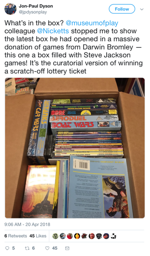 When I joined Mayfair Games in 2005, I joined a team that had already established their names and legacies in the game industry – and they, in turn, were building on the legacy of the Bromleys as the founders of Mayfair Games. Darwin Bromley's design resume includes the Empire Builder series, perennial favorite card games Express and Alibi, as well as being at the helm for many of Mayfair's roleplaying efforts (including editions of Chill, Underground, and the DC Heroes Roleplaying Game) and the development of Mayfair as the pre-eminent publisher of rail games. Although I never worked with him directly, his active involvement with Puffing Billy (along with his wife Trella and brother Peter) meant that I would see him at conventions a couple of times a year, and we'd talk game design, share any train-game releases that we thought the other person would be interested in (almost always him recommending something to me), and get a story or two from him about the early days of Mayfair. Always outgoing and always willing to share his opinions and advice, he was a charming conversationalist and knowledgeable teacher. 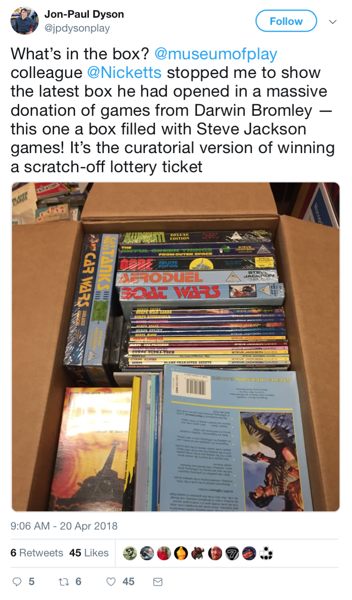 When his brother Peter died in 2016, the family began the process of donating their extensive collection of games to the Strong Museum of Play in Rochester, New York. Not only did Darwin create a legacy of games that earned him a place in The Academy of Adventure Gaming Arts and Design Hall of Fame, but many of those games, along with so many other examples from over a century of classic board games, will live on for people to study and play, both in personal collections and as part of the Strong Museum's curation. The last project I worked on at Mayfair was the new edition of Iron Dragon (co-designed by Darwin and Tom Wham). I'm sorry we never got out that new edition of Express that we discussed – we simply ran out of time. Fortunately for the hobby game industry, what was accomplished over his lifetime was impressive and lasting.